I recently heard this tuning, "0-9", played by Diego Sales of Brasil. He plays really fast, straight ahead jazz licks on it. He posted a layout of the harp, a 10-hole diatonic, when I asked "WHAT was that ?!!!" I'm hoping that Brendan and others will chime in on this layout, maybe give some more insight about the tuning and maybe post some other clips of this harp's tuning being played. I'm thinking it may not be a "new" tuning, but maybe it is. One will have to use a tranlator to read the blogspot post as I can't seem to copy and paste my translated version. The chart is rather hard to read, so I may be just taking up space here. When I try to blow the image up, it pixilates too much for me to read but I figure someone out there will know how to fix that problem. If so, please let me know how to do that. Let me know what you know about this tuning, please and thank you. The main advantage seems to be that when playing in cross harp you can get down to the low root note, while only sacrificing a few notes that are not that much used in this position by most(I think??) people. For songs that never go below the lowest root note, this would allow you to move them down one octave compared to where they are normally played, and this would give you at least two advantages. 1: You get a lot more of the tonic chord. 2: A lot more of your range has bends that are actually suitable for playing in cross harp, both for producing notes outside the Mixolydian scale that is natural for second position and for ornamentation. For a player who bends quickly and accurately this might maybe help for the fast playing you mention, especially since you do away with many of the overblows, but this is mere speculation from my side as I'm not such a player myself. With a Lucky 13 you could do anything done with this tuning using exactly the same patterns, while retaining the hole 10 and ALSO getting two more notes in the bottom. In a way you could say this is a "budget version" of the Lucky 13. If you like say Hohner MB this would be a way of getting some of the advantages of a Lucky 13 on your favourite type of harp. Thank you for the speedy replies! While I can clearly see the advantage of this tuning using the Lucky 13, I know that that size may be difficult to handle if it's held with a mic as well. I assume that Seydel could make a 10-hole 0-9 harp for me. If that is the case, I also assume I should lay the chart out as a 1-10 harp. I'm thinking the 0-9 might throw them off, but, again, maybe a silly question. Have any of you ever ordered such a tuning from Seydel in the 10-hole version? Or the Lucky 13? Does anybody know of anyone who has this tuning in the Lucky 13 for sale now and, if so, who made it and are they, the maker[s], still available? Who might they be and where to reach them? Also, if there are indeed folks who can make this, I wonder if they would accept one of my new, standard Richter scale harps to use. And, if so, is there a preferred key of harp to work with to make the above layout? Maybe a silly question, I just want some ideas. Thanks again, you two, and any others who may comment here on this topic. If anyone has one of these tunings, in any key, I hope that I may one day hear some of their examples. Cheers and HAPPY SPRING from here to those in the northern hemisphere !!! Oh, and HAPPY AUTUMN to those in the southern hemisphere, too !!! Peace. I assume that Seydel could make a 10-hole 0-9 harp for me. If that is the case, I also assume I should lay the chart out as a 1-10 harp. I did not yet order one. This is the key of C like in your example and lettered by Edvin. Of course you can transpose it into any key you would like. Any key within the standard range would be possible. For Seydel it is no "0 - 9" or "Lucky10" or anything else. For them it is just your personal configuration of a 10 hole harp, no matter what you might prefer to call it. I hope I did understand your question right. And the key to chose is what you want to play. All this is considering that you would prefer a 10 hole harp. If you like better a Lucky13, you should buy a Lucky13. As far as I did understand Edvin's implementations, a standard version (Richter) of the Lucky13 would cover your needs. But I never have played one myself. Maybe you can have a look on the Seydel Solist Pro 12 Steel. It is configurable too. But it is remarkably more expensive. Thank you, Triona, for your thoughtful reply. Yes, I do understand it could be in any key. I am still not quite certain what the Lucky 13 layout would be; just the same layout continuing up to hole 13 from hole 10 ? Or, is it extended on the bottom and if so, what would be the notes as per the above 0-9 chart ? If you can, please write a chart for what a Lucky 13 would look like using this tuning. Thanks. I apologize for my ignorance here, as I can't see the layout offered by Edvin as I write this. Maybe I can figure it out after I post this. At any rate, thank you for your reply. I'm getting excited to try this tuning. I think I will hold off on the Seydel Solist Steel, I do know about it. 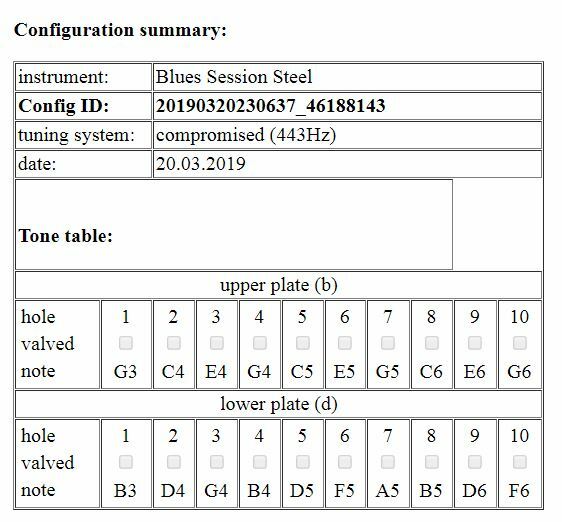 I have that same 12-hole, solo-tuning on my new SHG-Hering "Special 24" Beautiful harp, only a bit longer than a standard 10-hole diatonic, easy to cup with a mic, quite loud and crisp. Slightly off-topic now, I also just received an SHG-Hering "See See Rider". It is a 12-hole chromatic with "C6" tuning, in C, also a lovely harp. My playing chro has suddenly become a LOT more interesting, easier, too, no more redundant Cs at the 4-5 and 8-9 junctures . Yipeeee !!! Thanks again, have a great day and, again HAPPY SPRING !!! A Lucky 13 is the same tuning, only with one extra hole at the top and two extra holes at the bottom. Last edited by EdvinW on Thu Mar 21, 2019 10:28 am, edited 1 time in total. Ohhh, thanks again, Edvin. I'm getting at least one of each !